While driving to SFO to pick up my parents, my brother took a quick detour to a small diner by his work in Burlingame and bought Jalapeno Bacon Fried rice for Jane and his wife. I could tell by the grin and facial expressions on Jane’s face that she really enjoyed it. She usually doesn’t like to eat bacon, but devoured it with a quickness! Suposedly it is one of the best fried rice she’s ever eaten. Unfortunately, I was not able to get a taste since it was one of my vegetarian days and I couldn’t eat meat. Boooo! Last weekend, I had some left over bacon and asked her if she wanted bacon and eggs for breakfast. 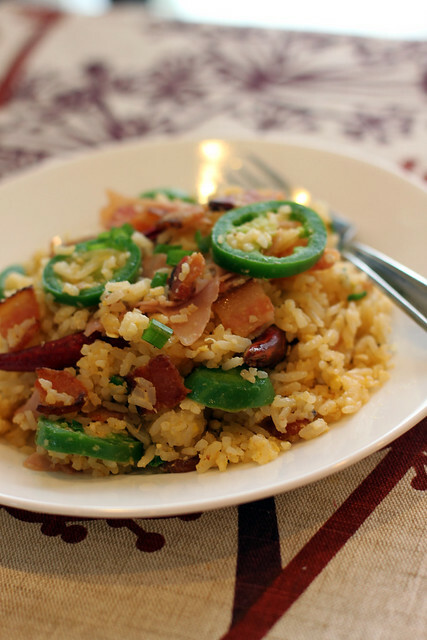 She scratched that idea and asked me to recreate the jalapeno bacon fried rice. 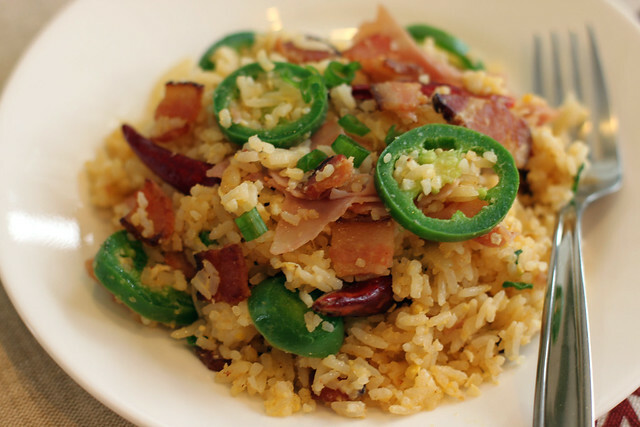 Like a reporter, I took out my notepad and she described the smoky bacon and spicy flavors of the fried rice, yellow rice color, thinly sliced deli ham and emphasized eating hot jalapeno chilies in every bite. After the rice finished cooling, I happily recreated the dish for her and this time, for me too. After I took the first bite, this time, I happily gave her the grin and facial expressions she gave me the first time she ate the jalapeno bacon fried rice. Season rice with salt, garlic powder, onion powder, and cayenne pepper. Crack two eggs to the rice, and mix rice and egg until evenly coated. Heat wok to Medium High. 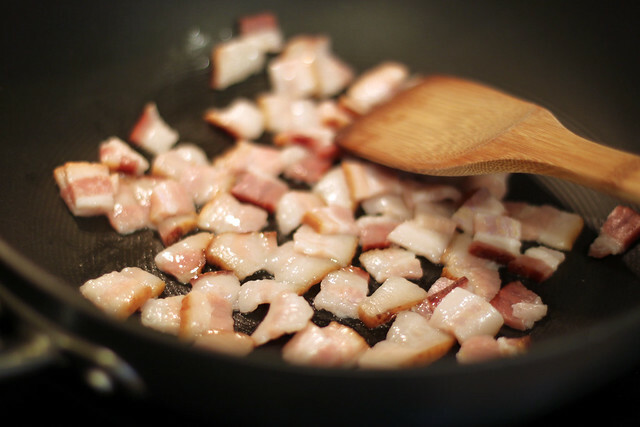 Stir fry bacon until crispy. Add onions and dried red chilies and stir fry until onions soften. Add garlic and stir fry until fragrant. 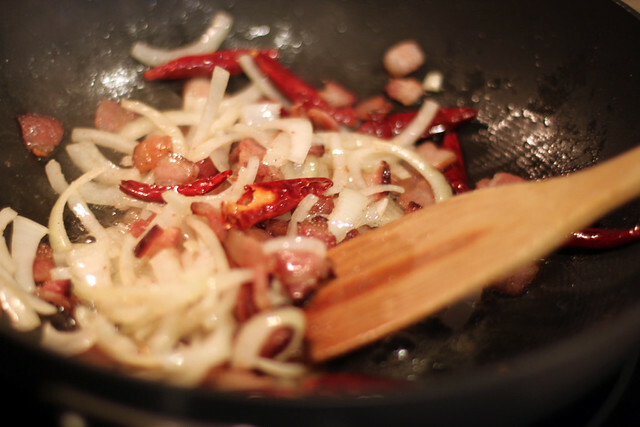 Add rice to the wok and combine with bacon and onions. Create a well in the middle of the wok. Crack remaining two eggs in the center and scramble. Combine egg into the rice. 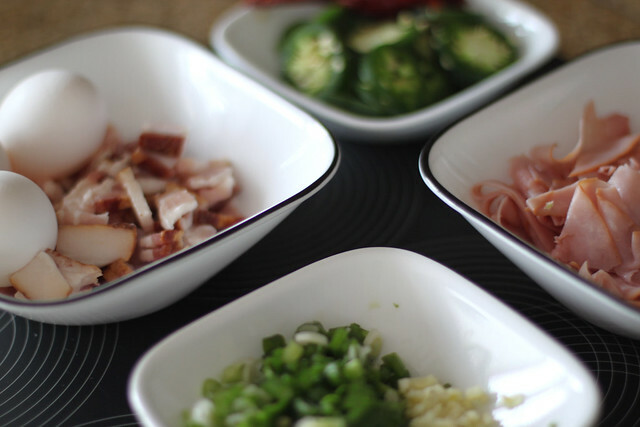 Add soy sauce, ham, jalapenos, and scallions. Mix until everything is combined.